If ignorance is bliss, that would explain why Americans are so happy. We love our hot dogs; we just don't want to know how they're made. The same could be said of the inner workings of our government. We want transparency, but we still want to be able to sleep at night. If you fall into that category, you may not want to read on. As you weave through interstate traffic, you're unlikely to notice another plain-looking Peterbilt tractor-trailer rolling along in the right-hand lane. The government plates and array of antennas jutting from the cab's roof would hardly register. You'd have no idea that inside the cab an armed federal agent operates a host of electronic countermeasures to keep outsiders from accessing his heavily armored cargo: a nuclear warhead with enough destructive power to level downtown San Francisco. That's the way the Office of Secure Transportation (OST) wants it. 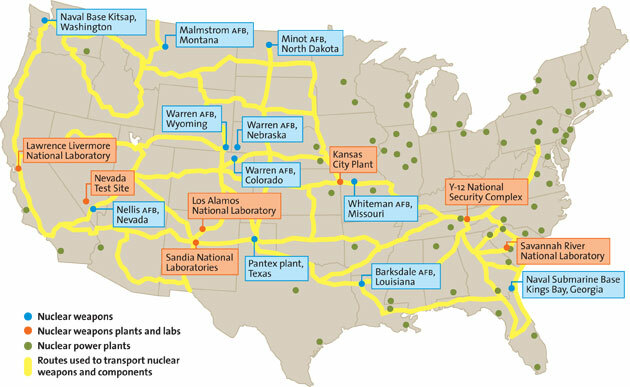 At a cost of $250 million a year, nearly 600 couriers employed by this secretive agency within the U.S. Department of Energy use some of the nation's busiest roads to move America's radioactive material wherever it needs to go—from a variety of labs, reactors and military bases, to the nation's Pantex bomb-assembly plant in Amarillo, Texas, to the Savannah River facility. Most of the shipments are bombs or weapon components; some are radioactive metals for research or fuel for Navy ships and submarines. The shipments are on the move about once a week.